with your FREE HealthBeat newsletter subscription. Read our "zero tolerance" spam policy. Do You Really Take All That Stuff ??? I was in a local store today; the owner and I are on friendly terms. 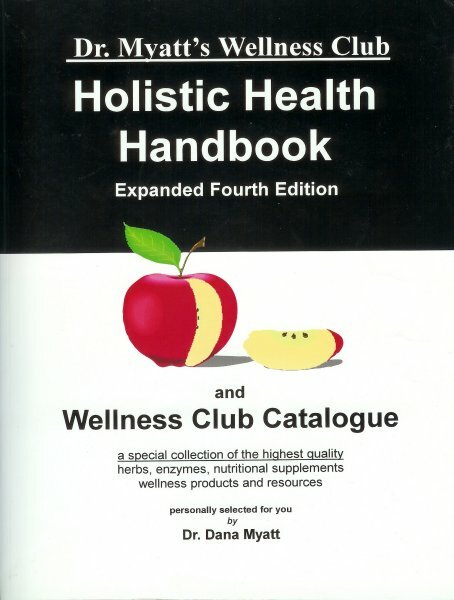 In fact, we had given her a Wellness Club Holistic Health Handbook as part of her Christmas gift. Apparently, she has been reading it. She asked me today when I was in, “Do you really take all that stuff you recommend? Can’t you just get adequate nutrition from a good diet?” Good questions, and I was shaking my head “yes” and “no” before she even finished asking. Yes, I really take a lot of my own Wellness Club “stuff” (more in a minute). In fact, one of the main reason I started The Wellness Club almost 10 years ago was to ensure myself easy access to “the good stuff” (highest quality nutritionals). And “no,” you can’t get adequate, much less optimal, nutrition from diet alone. Here are the reasons I take supplements. Why a “good diet” is not optimal. First let’s define some terms: “Adequate” means barely enough to sustain life. Yes, you can probably achieve that from an exceptionally good diet. Who eats an exceptionally good diet? But you can’t get “optimal nutrition” — vitamins and minerals at levels known to promote longevity— from even a very good diet. That’s because our food supply isn’t what it used to be. To see a complete chart of Optimal doses of vitamins and minerals, click here. Vegetables without Vitamins. The nutritional value of foods is rapidly declining. According to the USDA food tables, most commercial vegetables contain at least 50% less of the nutrients than they did in 1975. For example, broccoli has 50% less calcium than it used to; watercress has 80% less iron, cauliflower has 40% less vitamin C. The National Academy of Sciences reports that it takes twice as many vegetables as it used to to get the same amount of nutrients. The reason for this decline appears related to growing and agricultural practices. That, plus many foods are heavily contaminated with pesticides, synthetic fertilizers instead of the natural nutrients, and picked before their prime (full nutrient content) so they can be shipped to far away places for consumption. If the nutrients aren’t in the soil, they won’t be in the plants grown in that soil. The recommended 3 to 5 servings per day should rightly be changed to 6 to 10 servings per day of fruits and vegetables to get a basic complement of plant-derived nutrients. Do YOU eat this much in a day? Few Americans do. Meat without Omegas. The Omega-3 fatty acids, along with Omega-6 fatty acids, comprise the “Essential Fatty Acids” (EFA’s), so-called because they must be obtained from diet. The average American diet is far too high in O-6 fatty acids and drastically deficient in O-3 fatty acids. The result is that our immune systems tend to be hyper-reactive in many ways (allergies, autoimmune disease, heart disease, certain cancers and overweight are intimately related to this O-3 deficiency). The primary sources of O-3 fatty acids are meat (especially beef), eggs and seafood, particularly salmon, and flax seed. But even these “good foods” are not what they should be. The way we raise animals drastically alters— for better or worse— their Omega-3 fatty acid content, and therefore their Omega Ratios. [NOTE: as a reminder, a healthy Omega Ratio should be between 4 to 10. Less than 4 is super-healthy, more than 10 is an unfavorable ratio. Many nutritional scientists believe that the healthiest ratio is no more than 4]. Instead of grass-fed beef with an Omega ratio of 2.3, feed-lot and corn-fed beef has a less favorable OR of 8.6 or higher. (Still a decent OR). Feed-lot raised beef is also high in human hormones and antibiotics. Eggs raised from chickens fed a diet of Omega-3 rich grains and allowed to free-range will lay high Omega-3 containing eggs with an OR of 2.6, but most industrially-raised hens today lay eggs with an OR of 13.0. Salmon is by far the superior food for Omega-3 content, but there’s a wide variability in this, too. Wild-caught Pacific salmon has an OR of 0.5 and very low levels of contaminants. New information released this month shows that farm-raised salmon tend to have high levels of contaminants including methyl mercury and PCBs, antibiotics, pesticides, synthetic coloring agents, growth hormones and GMOs. The OR for farm-raised and Atlantic salmon is far less favorable at 6.8. (Still a good Omega Ratio, but is the toxicity worth the risk?). Even a diet that includes the USDA recommended fruits, vegetables and meats is still unlikely to be “adequate.” Inadequate nutrition plus additional contaminants in the food mean that even a well-meaning diet may be less-than-adequate. But even if it were “adequate,” adequate isn’t good enough for me. Much is known about how to keep a human body healthy for life and maximize longevity. The sciences of nutrition, biochemistry, pharmacology, exercise physiology, and psychology have contributed much to improving both quality and quantity of life. Although drugs can be helpful and sometimes curative, they are not the surest option for maintaining good health. I take advantage of those diet and lifestyle methods that have proven to help hedge the bet for a long, healthy life. Studies have been done on elders (over 60 population) taking a multiple vitamin-mineral supplement. Those on low potency formulas (the “one little tablet per day” variety) did nothing more than placebo, but those taking higher potency formulas had a 60% lower rate of upper respiratory infection plus overall stronger immunity. Optimal, not merely “adequate” doses of various vitamins and minerals have far-reaching effects in the body. Consider the numerous benefits I get just from taking Maxi Multi — my ultimate basic multiple nutrient formula. A deficiency of antioxidant nutrients (especially beta carotene, vitamins C & E, and selenium) is associated with higher incidence of cancers of the colon, breast, prostate, mouth, lungs and skin. Some researchers believe that antioxidant deficiencies may be related to higher incidence of all cancers. Antioxidant deficiency is also associated with cataracts, macular degeneration, cardiovascular disease and premature aging. A mineral deficiency, especially magnesium and potassium but also calcium, is associated with high blood pressure. Deficiencies of vitamin E, C, B6, B12, folic acid (a B vitamin), and bioflavonoids are associated with cardiovascular disease. The connection between vitamin E and heart health is so well established that conventional medical cardiologists are instructed to recommend vitamin E to their patients. Healthy bones, and the prevention of osteoporosis, depend on sufficient levels of minerals, including calcium, magnesium, boron, zinc, copper, B vitamins, and vitamin D. Calcium deficiency is also associated with overweight and colon cancer. In males, benign prostatic hypertrophy and prostate cancer is associated with decreased levels of zinc and selenium. Zinc deficiency also correlates to decreased immune function. Hypoglycemia (low blood sugar) and diabetes (high blood sugar) occur more frequently in people who are chromium deficient. After diabetes is present, low levels of vitamin A, C, E, plus zinc, selenium, choline, bioflavonoids and B complex vitamins are associated with more complications from the disease. Deficiencies of B complex vitamins are associated with heart disease, fatigue, muscle weakness, depression, Alzheimer’s disease, and senile (age-related) dementia. The list above represents only some of the diseases that nutrient deficiency can cause. Studies show that people who do not have nutrient deficiencies have a greatly lowered risk of these diseases. I’m hedging my bet by making up for any gaps in my diet by taking a high quality multiple vitamin/mineral supplement. II.) Extra antioxidants (A formula with higher potencies of Vitamin A, beta carotene, vitamin C & E, and selenium. I would usually use Carlson’s brand of “ACES” for the extra antioxidants. (1 cap, 3 times per day with meals). III.) Extra calcium/magnesium and trace bone nutrients (boron, vanadium). I used one of several different formulas to “make up the difference” that the multiple didn’t contain. (3-6 capsules per day). IV.) Multi-B-Complex: extra-potencies of B complex vitamins, higher than even a good multiple, for the many proven health benefits. (1 capsule, 2 times per day). All together, this Basic program was 17-20 capsules per day of the finest nutritional supplement available. 4 separate products, but well worth the effort and money in my book. Many agreed with me. Then I decided to make it simpler. It was state-of the-art supplementation. Because this protocol is still valuable today (the individual formulas have been kept up-to-date), this is still a good program to follow. I just decided to make it simpler. Yes, I “take my own stuff.” The benefits of optimal potency supplementation on health and potential lifespan are clear-cut in my medical opinion. I knew I was “in it for the long haul,” and so were many of my patients. In order to make such optimal supplementation easier and more cost-effective, I devised a formula that had these optimal potencies in a single supplement. Maxi Multis have the combined benefits and nutrient levels as the previous four-supplement regimen I was prescribing. There were and still are other benefits to making my own formula, too. I.) Maxi Multi: 3 caps, 3 times per day with meals, without fail. II.) Maxi Greens: 2 caps, 3 times per day with meals, without fail. III.) CoQ10 (50mg): twice per day. IV.) Flax oil: caps or liquid, daily. I take additional supplements, but this list forms the basis of my program. Please keep in mind that I do not have any medical conditions that I am treating. If I did, my basic program would reflect additional nutrients and/or herbs targeted to whatever my medical problem was. 2.) Foods: I choose organic fruits and veggies whenever possible. I also look for wild instead of farm-raised salmon and grab organic beef whenever I find it. I search out Omega eggs (available in the regular grocery store). I follow The Super Fast Diet (low carbs, high in Omega-3 essential fats). 3.) Exercise: every day in the outdoors. I live in an area where the air is clean. If I didn’t, I’d have an indoor and car air purifier. 4.) Pure water: 64 ounces a day without fail. Your Alternative Medicines Superstore! Find pharmaceutical-grade vitamins, herbs and other highest quality alternative medicines here. This 140 page health manual covers 70 diseases and alternative medicine treatment options, including the latest scientific information on vitamins, herbs, diet, nutrition and exercise. Also included are descriptions of many of the products available in our alternative medicines pharmacy. These statements have not been evaluated by the Food and Drug Administration. These products are not intended to diagnose, treat, cure, or prevent any disease. No information on this website is intended as personal medical advice and should not take the place of a doctor's care. All material on this alternative medicines website is intended for educational and informational purposes only; it is not a substitute for personal medical care. Please consult your physician or healthcare provider regarding the applicability of any information contained herein. Please read A Letter from Dr. Myatt: Read This First to gain a complete understanding of how best to utilize alternative medicines and this website. If you are confused about your alternative medicines options, a telephone consultation with Dr. Myatt will put you on the road to good health. Click here for your alternative medicines consultation. Finally, * none of the statements made in this website have been approved by the FDA or any other government organization, although all information contained herein is scientifically verifiable. Use this information at your own discretion as a free American. © 1994-2019 Dr. Dana Myatt's Wellness Club. All rights reserved.